NACOGDOCHES, TX (KTRE) - The Stephen F. Austin State Lumberjack basketball team is packing its bags for Dallas. The Lumberjacks will play in the NCAA tournament on Thursday night. Nacogdoches businesses and fans are rallying to support the team at home. Talent is essential on the basketball court, but fan support plays a central role in big wins, too. 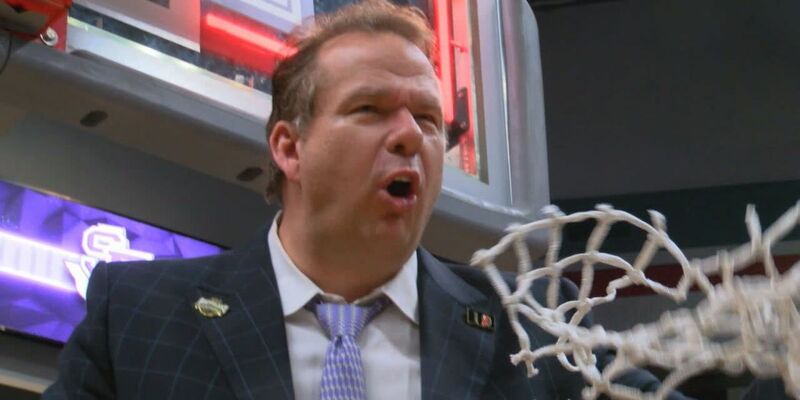 SFA Lumberjack Basketball Coach Kyle Keller even sees the fans in his sleep. "I had this dream this year that we would play in Dallas, and somehow, we could win two games and it would just be lined up, just like Hoosiers, driving back to Nacogdoches," Keller said. More than 3,000 fans watched as the Jacks won the Southland Conference Tournament in Katy. Dallas isn't that much further to line the streets. Those staying at home will line the streets with SFA flags and everything purple. "Well, you know Thursday is going to be a big day for the Lumberjacks," said David McClelland, Tipton Ford's sales manager. "At Tipton Ford, we're going to have purple and white balloons on all the vehicles, and we're all going to have on our SFA shirts." Those who stay home may end up at a watch party. "We will have plenty of seating, plenty of room, good drinks, good food," said Jonathan Cyuksi, an employee at Frog's. The exposure of Nacogdoches and SFA on television to billboards provides a marketing tool that ends in a sure victory for the Nacogdoches County Chamber of Commerce. "It enhances the image of the university in terms of its profile in the sports world, but it also helps name recognition around the country," said Wayne Mitchell, the CEO and president of the Nacogdoches County Chamber of Commerce." "One more, right?" Keller said to his team. With cheers, the Lumberjacks responded, "Yeah!" "I'm not quitting on that dream. I just believe it," Keller said. "And I think if you just will your team into certain things, you can will it. I'm not going to stop that dream." Fan support can make it come true. A sendoff for the team is scheduled in Nacogdoches tomorrow at 2 p.m. from the William R. Johnson Coliseum.